October | 2014 | Wait... What? I first attended PopTech in 2009, and I had very little idea of what I was getting into. I had never heard of “design thinking” and though I had been working with technology and social change, I was new to the wider field of “innovation.” So PopTech was pretty mind-blowing for me. I remember meeting a couple of guys from Frog Design early on, and I ended up kind of tagging along to what they were doing a lot of the time (they were very cool about it). It now cracks me up that back then I had never heard of Frog. I’m pretty sure I’ve come a long way since 2009. I’m no longer very impressed by product inventions – I’m more excited when someone is able to innovate through a whole cycle, rather than just invent a product. And that process requires a lot of thought to things like logistics and ecosystems. Innovation differs from invention in that innovation refers to the use of a better and, as a result, novel idea or method, whereas invention refers more directly to the creation of the idea or method itself. Innovation differs from improvement in that innovation refers to the notion of doing something different rather than doing the same thing better. But that’s another blog post…. 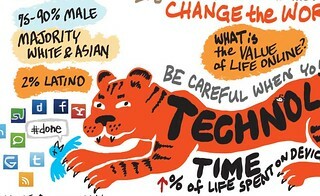 So, what did I learn at PopTech 2014*? I like humility. The stage is a hard thing to manage for some people (including myself). I noticed this time around at PopTech that I didn’t pay as much attention to the super polished speakers and the ones with lots of inspirational quotes. The theme was “rebellion” and I liked the people who didn’t necessarily think of themselves as rebels, but who were just doing their thing. I liked hearing the stories from those who seemed less accustomed to the stage, who didn’t have a Ted-Style hero story, and who seemed a bit uncomfortable in the limelight. When it comes to social change, I believe that humility is a key ingredient. Being true to a mission through and through is critical whether you are working in a non-profit or as a social entrepreneur. It was great to see folks on stage who are living their ethics through their work. Peter Durand’s illustration of Anil Dash’s talk. Good facilitation is like good user interface design. I ran into Matt, one of the ‘design’ folks I met at PopTech 2009. I loved how he explained working on a user interface for Xbox: “You have to anticipate the users’ needs and be there for them when they need help, and then get out of the way as soon as possible.” It sounds a lot like good facilitation – whether of a workshop, a community development process, or learning – and maybe even a little like good parenting of teenagers. It’s OK to take time out for yourself at a conference. At my first PopTech, since I felt out of my element, I felt awkward when there were times I was standing alone with no one to talk to. Perhaps thanks to all the books and articles on introverts and extroverts over the past few years, this time around I realized it was ok to sit out sometimes (I’m a bit of an introvert). So at this PopTech, I purposely found time to sit by myself for a few minutes to think, or to go for a walk or a hike and to just be on my own or be a bit quiet for a while to regenerate. It made the socializing more enjoyable and helped me to keep my mental and social balance. It’s OK to not ask people what they do. One of my favorite conversations at PopTech was on the way home from the closing event, on the bus. I was out of energy and tired of hearing my own voice, so I just asked the person next to me to please not ask me what I did or where I was from, and could we just have a normal conversation? Luckily I was sitting next to Peter Durand, (master illustrator) and we had an amazing chat about all sorts of things, including what we both did, but in a much more roundabout way. It’s OK to chuck the elevator speech. In addition to getting tired of hearing my own voice, one of the reasons I dread the “what do you do” question is that I don’t exactly know how to explain what I do. I tend to change my explanation according to whom I’m talking with. Not to mention, I do a ton of things, and they are hard to explain, so I am always looking for an entry point that might resonate with the person rather than a one liner. It was great to hear Courtney Martin talk about the idea of a “portfolio career” as something her mother had and something that she has as well. A portfolio career is when what you do doesn’t fit on a business card because you do so many different things, or because there is not really one description that fits all the things you work on. I love this – as it felt like permission to never try to come up with an elevator speech again. It’s OK to have a vocation rather than a job. Another point that resonated with me was the point about having a vocation over having a job. There has been plenty of debate in the development community about this, and I always land on the side of development work and community organizing being a vocation, not just a job. Some say that development work should be seen as a profession, and it doesn’t matter how development workers live outside of the job, but I’ve never been comfortable with that idea. I believe that values, ethics, and ego need to be in check and well-aligned if a person wants to get involved in socially oriented work. Vocation goes further than a job, and it’s a combination of the set of values and beliefs you bring to your life’s work. It’s what you do because you just can’t not do it, as Palmer noted. It’s OK to go to a conference just to learn and connect (but it has to be the right conference). Attending something like PopTech is luxury – I’m well aware. If you are trying to convince someone to pay for a conference, normally you have to justify it with some goals or “return on investment.” But when I go to conferences with specific goals in mind, or when I’m told to go anywhere with an “ask,” I tend to leave empty handed after some awkward interactions. When every conversation is seen as a way to “get something” I tend to be stressed, and every interaction feels engineered rather than natural. I end up with much better results when I go without an agenda and when new ideas form together with someone else based on an authentic conversation or experience. Because PopTech is the “right” kind of conference for learning, and it’s set up to help people make real and in depth connections, it’s fine to go without any agenda other than learning, sharing ideas, and meeting people. So once again, tons of learning at PopTech and above all, great people and connections. I hope I can make it back sooner than in another 5 years! How can gaming contribute to development? Our Technology Salon in New York City on Oct 7 focused on the potential of games and gamification in international development work. Joining us as lead discussants were Asi Burak (Games for Change), Nick Martin (TechChange), and Craig Savel and Stan Mierzwa from Population Council. TechChange is a social enterprise that uses principles of gamification on its online education platform to incentivize learners to participate and interact. Games for Change has been around for 10 years, working on convening events and festivals about games for social change, curating and sharing these kinds of games, producing games in an effort to mainstream social issues, and providing strategy support for games. Population Council is using personalized avatars (participants select skin color and tone, weight, dress, piercings, and sexuality) to encourage US youth in low-income settings to provide health data through online surveys. Public perception about games is mixed. Some people believe in the potential of games for a range of goals. Interest in gaming in the field of development is growing quickly – but many organizations rush into gaming as a ‘silver bullet’ or trend and do not fully understand how to go about integrating game theory or creating games. Others believe games are shallow and violent and cannot be used for serious work like education or development. More nuanced discussion is needed to distill out the various ways that games can support development. “The conversation needs to move from ‘why would you use games?’ to how can you use games? How do you succeed? What can we learn from failure? What methodologies work and what are the good practices? Games for Change is working on a typology report that would outline what games can do, when, where and how. The organization is also working to define how to measure success for different types of games. A learning/educational game is very different from an awareness raising or a behavior change game, and approaches need to reflect that fact. 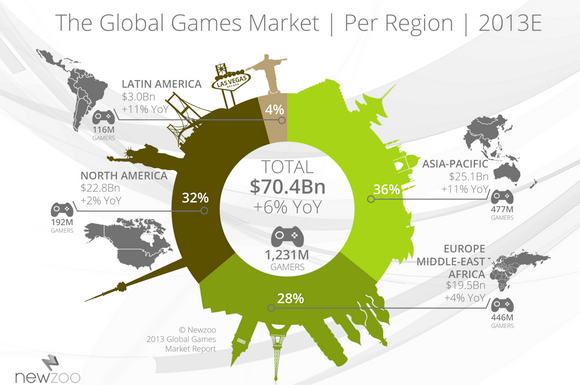 (Co)-creation of games is indeed happening all over the world. Rather than create games in New York or DC, there are huge opportunities for working with local developers to create games that resonate with local audiences and communities. Some organizations use open source, free software such as Scratch, a game making software that even children are using to create games. “In Colombia, we used Scratch to engage kids who were going to Internet cafes and just doing emails and chatting. We trained the kids in 30 minutes and they learned to program in blocks and to do animations and make games,” reported one Salon participant. Games and gamification resonate with all cultures because they stem from play, and all cultures play. There are cultural differences however that need to be considered, and even more important may be aspects like gender barriers, urban/rural differences, and access to the technology and platforms on which digital games are played. In rural Uganda, for example, one organization is using gaming in an online learning program with 3000 pharmacists to train them on how to use a new rapid diagnostic test for treating malaria. The gaming was not a problem, as the group was well versed in gaming concepts. The challenge was teaching the group to use computers. It’s likely that fewer women and girls game in some contexts because of their lower access to technology, lack of time, cultural/gender barriers. Moving games to mobile may help reduce technology barriers. SMS gaming has been quite successful in some cases. One example cited at the Salon was DoSomething.org who created an SMS-based game around teen pregnancy that girls and their boyfriends could sign up for. 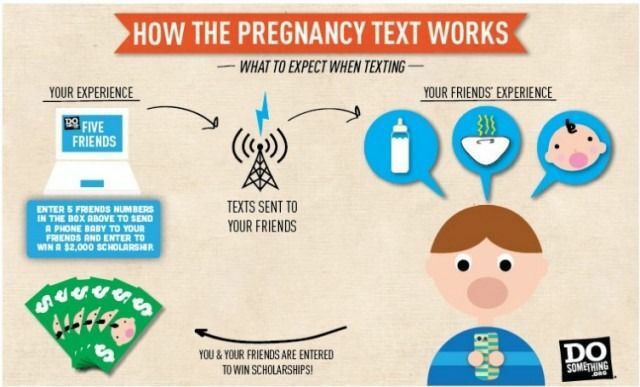 They would receive texts from “the baby” asking for a diaper change, food, and other things, and this helped them to understand what having a baby might be like. The game was very social and engaged both males and females. What about girls and women and gaming? The field of gaming has traditionally appealed to men and boys, noted some, but what is behind this? Some Salon participants felt this was in part because of biological differences, but others felt that we may be playing into stereotypes by thinking that men like gaming and women like social media and communication. One study (by Matthew Kam), for example, notes that when girls in India were given mobile phones on which to play a literacy game, their brothers would often take the phones away and parents would not intervene. Women are gaming – a lot! Statistically speaking, in the US and Europe, women are now around 50% of gamers. There is a big gap in terms of women game developers, however, and the gaming field is struggling intensely with the balance shifting to a more equal one between men and women.This has erupted into a controversy called ‘GamerGate’ that is rocking the gaming industry and provoking a heated (and often ugly) conversation. “Women who game and who develop games face an incredible amount of harassment online and in person because they are a minority in their field,” commented one Salon participant. Can games reach low income gamers in ‘developing countries’? Much of the gaming dynamic will need to adapt if we want to reach lower income populations. Likely this will happen through mobile, but in places like Kenya and India, for example, people have mobiles but don’t download games. “It may take 5-10 years before people everywhere are downloading and playing mobile games,” said one Salon participant. In addition, there is a lot of work to be done on business models and monetization so that these efforts are sustainable. “People love free things. And they are not used to paying for things in the digital space.” In the meantime, analog games can also be hugely beneficial, and many organizations at present are using more traditional games in their work. As a starting point, Games for Change’s website has a good set of resources that can help organizations begin to learn more. We’re also compiling resources here, so take a look and add yours! Thanks to Nick, Asi, Stan and Craig for joining as lead discussants, and to Population Council for hosting the Salon! If you’d like to attend future Salons, sign up here! It’s been two weeks since we closed out the M&E Tech Conference in DC and the Deep Dive in NYC. For those of you who missed it or who want to see a quick summary of what happened, here are some of the best tweets from the sessions. We’re compiling blog posts and related documentation and will be sharing more detailed summaries soon. In the meantime, enjoy a snapshot! If we are not careful, the next big iNGO scandal will be vulnerable people's very personal data being exposed. #MandETech. #MandETech @souktel #monitoring and #evaluation: it is neither about #ict4d nor about incentives! It is about putting communities first! "I am not an M&E person. I'm a tech person with an M&E problem" = best line at #mandetech today.
.@fabtweet at #mandetech: Design is often the missing link between data and decision making.
.@mozilla working on 10-15 dollar smartphone handsets – will that change the way #mandetech is carried out? On #realtime #data in #MandETech: Being data thoughtful v data greedy — we've got the collection tools, let's focus on meaningful analysis. RT @unimps: #Mandetech @gschiche @TechChange @USAID you can see the principles at http://t.co/StWiUtcnly we love feedback. If organizations fully adopt #MandEtech for better program activities, will that lead to a whole new way to do development? “Are we recreating biases when we move from analog to digital #MandEtech systems?” Great Q!